foodnutzz...by nature & nurture! : it's christmas....time to talk turkey. it's christmas....time to talk turkey. Well for many of you Christmas will be happening in two days time yet with many of my family travelling over the December/January break Christmas came early two weeks earlier this year....and I promised to bring the turkey. As my turkey defrosted in the fridge....my mind ticked away on what creation I could make. I wanted to do something different this year, yet sooo many turkey combinations I was suffering choice overload! My thoughts were answered when I after a food photography shoot I was presented with some left over preserved lemons. This was to be my 'mystery box' ingredient and inspired me to cook a turkey with Moroccan flavours. After immersing myself in my cookbook and magazine collection I came across two recipes that delighted. One by Valli Little from an old delicious magazine and another from an old Cuisine magazine by Ray McVinnie. I adapted the saffron butter from Ray's recipe and borrowed the green olive & preserved lemon stuffing idea & brushing with honey from Valli ...then added my own little inspirations to create a couscous stuffing. The honey saffron butter delivers a moist fragrant tasting turkey with a delicate sweetness. 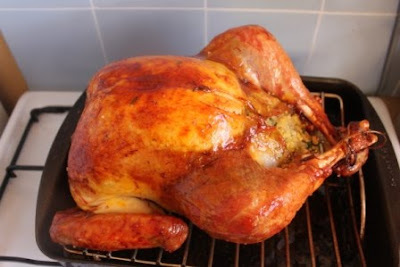 yet also gives the turkey a rich golden hue to the skin. Using sicilian olives give the stuffing a gentle olive note and the lemons l add a delicious zestiness. To make stuffing, place stock in a saucepan. Bring to boil. Remove. Stir in couscous. Cover. Stand 5 minutes. Fluff with a fork. Transfer to a bowl. Meanwhile heat oil in a frying pan over medium heat. Add French shallots and cook for 5 minutes, stirring occasionally or until golden and softened. Add garlic and thyme and cook for 1 minute. Remove. Allow to cool. Add to couscous with preserved lemon, olives, pine nuts and parsley. Mix until combined. Set aside to cool before stuffing turkey. Combine saffron, sugar and water in a bowl. Stand 20 minutes. Place butter into a small bowl. Using an electric beater beat butter with saffron and any saffron liquid until well combined. Remove and discard giblets and neck from turkey. Rinse inside of turkey with cold water. Dry inside and out with kitchen towel. Fill turkey cavity with stuffing. Truss turkey and secure with kitchen string. Work fingers gently between breast meat and skin of turkey being careful not to tear skin. Rub half the saffron butter over breast meat. Rub remaining saffron butter over outside of turkey. Season with salt and pepper. Cover turkey loosely with lightly greased foil. Place breast side up on a lightly greased rack in a roasting pan. Cook in a moderate oven (180C) for about 3 hours. Remove from oven. Remove foil. Brush turkey with honey. Cook for a further 45 minutes or until cooked through. Place turkey on a tray to rest. Cover loosely with lightly greased foil. Meanwhile scape pan juices into a saucepan. Stir in flour. Cook, stirring, for about 1 minute or until thickened. Remove from heat. Gradually whisk in stock until combined. Stir in wine and quince paste. Bring to boil, stirring constantly. Cook for a further 2 -3 minutes or until thickened. Season to taste with salt and pepper. Serve with sliced turkey and stuffing.